I just completed a six week photography class, which in my mind, made me more than qualified to run a real photo shoot. I had great ideas and locations in mind, but my dilemma was finding people to pose for me. Luckily, five little “monkeys” were being driven in from Louisville, KY by my sister and her husband last weekend. “Monkeys” can be a little difficult to work with sometimes because of their sporadic nature and their resistance to sitting still, but no one would argue that they are the best and most beautiful things to photograph. Believe it or not, the photo shoot did got as smoothly as planned. Apparently, I haven’t learned everything there is to know about proper lighting and avoiding blurriness. ( Hold On! My computer just told me that blurriness is not a word – whatever! ) I don’t know what went wrong. As the monkeys moved about, I moved with them, snapping pictures like a maniac. Isn’t that what the professionals do? When I took a moment to see what kind of shots I was getting, all I could see was a bunch of blurry monkeys. I could feel myself getting frustrated and anxious because I knew my models would only last so long, which means I had to pull it together, quick! Over all, the monkeys were fantastic to work with – real naturals -and I look forward to working with them again, because next time, I’ll do better. I did get a few shots that I’m proud of – photos that captured the true essence of them. I can actually see the spirit of each and every one of them shining through in the pictures. It’s like magic! At first glance, many people comment how similar the three older girls look because of their mutual brown hair and brown eyes, but I see three completely different faces, personalities, and individuals. I love that at their age, they still celebrate and believe in the beauty of themselves. They all see themselves as the pretty princess in their own story and it never occurs to them to see themselves as anything other than magnificent. Oh, how I wish that feeling could last a lifetime. But every woman I know, including myself, grows up to see a reflection in the mirror that no one else sees but her. She will see every blemish, every gray hair, every extra pound, every funky mole, and every knobby knee. She’ll see everything, except the reality that all these “flaws” do indeed make her beautiful in her own way. I’m starting to believe that if we’re doing this “life” thing right, we should be able to make it through all that internal trash talk and end up on the other side of it. And when we do make it to the other side, we should be aware of how unique we are and celebrate that. We should know who we are, be proud of it, and use that confidence to live our best life. Not acknowledging and celebrating the woman we are, and still working to become is not only our loss, but also a tremendous loss for everyone around us. That, ladies and gentlemen, was my impromptu lecture for the women of the world! Excuse me for a moment, as I now step down from my soapbox. As with the end of any big photo shoot, dessert was served for a job well done. At least, that’s the way my photo shoots are gonna go down! 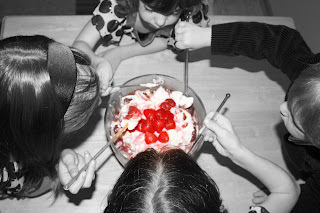 I made a Strawberry Cheesecake Trifle as a treat and since the monkeys did so well, I gave them each a long spoon and let them dig in and devour as only kids can do! Amy and I did some serious damage to it also, only because it was soooooo good – if I do say so myself! Darn! Wish we lived closer so I could let my "monkey's" pose for you! I haven't had any good family pictures made in 3 years!! I hate going to a studio and having pics done that look like the last 100 people who got pics done there. YUK. Don't like the "norm". Anyhow, you are SO right about your lecture for women. My dad always tells me how beautiful I am...which I know..he's my dad..he's supposed to say that..but still, it makes me come home and look at myself and say "REALLY?" I wish I could see myself more objectively.